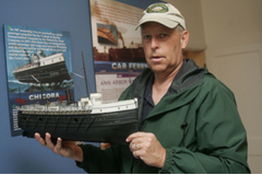 Kit Kartsen, manager of the Zeeland Historical Society, holds a model of the steamer Chicora, which shipwreck hunters are still searching for. Brian Forde. Great Lakes shipwrecks are on display at the Dekker Huis/Zeeland Historical Society Museum. A new exhibit, titled "Lost & Found Shipwrecks of West Michigan," opens this month at the museum, at 37 E. Main Ave., and will run through December. The show, created by the Historical Society with the help of Michigan Shipwreck Research Associates, features exhibits on 14 ships that were lost in Lake Michigan. Kit Karsten, the Historical Society's manager, said the exhibit has two themes - the development of ships from wooden-made to engine-powered and the different ways ships have gone down in Lake Michigan. "It is the history of boats and the history of the tragedy that went with it," Karsten said, adding the exhibit should be interesting to area residents. "We live next to the greatest body of water in the world, in my opinion, and shipwrecks are a part of the history." He said two of the ships have ties to Ottawa County, the H.C. Akeley and Hennepin. The Akeley was launched in 1881 in Grand Haven and named for area industrialist Healy Akeley. The wooden hull bulk freighter was carrying about 54,000 bushels of corn from Chicago to New York on Nov. 11, 1883, when it plunged to the bottom of the lake. The freighter, guided by Captain Edward Stretch, came across a tugboat towing a distressed schooner. The schooner sank, damaging the tug's machinery. The Akeley came to the tug's aid but eventually had to cut it loose because it was straining the freighter's rudder. The damage to the rudder caused the Akeley to begin to sink. Another ship, the Driver, approached the freighter the next morning and 12 crewmembers launched a lifeboat to board the Driver. Stretch and five other crewmembers decided to wait on the freighter to be rescued. But the six men went down with the ship. The Akeley shipwreck was discovered in 2001 while searchers were hunting for the steamer Chicora in the waters off of Saugatuck. Another ship, the Hennepin, sank on Aug. 18, 1927. The steamer traveled the Grand Haven channel hauling aggregate from a stone quarry from the Grand River. The stones were used as the foundation for many famous Chicago landmarks, including the Alder Planetarium and Field Museum of Natural History. Karsten said the Hennepin unknowingly became the first self-unloading steamer in the world and became a model for other ships. Michigan Shipwreck Research Associates members found the Hennepin in 2006 off the shores of South Haven. The shipwreck was recently listed on the National Register of Historic Places. Historical Society member Dorothy Voss said the idea for the shipwreck exhibit came from society members' desire to bring in Valerie Olson van Heest, director of Michigan Shipwreck Research Associates, as a speaker for one of their programs. The concept for the exhibit grew from there. Karsten said the Historical Society raised about $4,000 for the exhibit through private donations and a $1,200 grant from the Community Foundation of the Holland/Zeeland Area. Along with the Akeley and Hennepin, the gallery show features 12 other shipwrecks, including three ships that sank near Pentwater in a horrific storm on Nov. 11, 1940. Also featured are a side scan sonar, which is dragged through the water to take photos of shipwrecks, and drawings by Blendon Township resident Robert Doornbos, a member of Michigan Shipwreck Research Associates. Doornbos's drawings are included in the exhibit, which he helped design with Van Heest and Historical Society members. The exhibit also showcases a DVD titled "Icebound Found! The Ordeal of the SS Michigan" and a book of the same name by Van Heest. The museum is open from 10 a.m. to 7 p.m. Thursdays and 10 a.m. to 2 p.m. Saturdays. Private tours also are available. Admission is free with donations accepted. For more information, call 875-8036.